The Ultimate Water Gun got listed on über-blog Boing Boing on Thursday night, and is now making the rounds of the other gadget blogs. Gizmodo said that the gun makes you the wearer look like a moron, that I have too much time on my hands, and that the gun is harder to make than it looks. Hey, Gizmodo, I take exception to that — the gun is not harder to make than it looks! So there’s a small amount of blog activity commenting on the Ultimate Water Gun, which means a brief flurry of photo inquiries from tech magazines. (I’m having my photo taken at Sync Magazine this morning, which will be the very first time that my face will appear in a lad magazine. I’m kind of nervous about it, for a variety of reasons; my previous attempt to get in front of the camera for a technology piece had embarassing results involving ringer calf socks and a Doctor Who hat, which is why I now prefer to use awesome punky models. Update: I got back from Sync, which is in the Ziff-Davis building around the corner from my office. We walked past the PC Magazine testing lab, which is surrounded by glass and full of server racks and serious-looking men with keys on their belts. The Sync editor and his photographer were very nice. I didn’t even have to wear a tank top or lick an iPod or anything! eBay item 5978705618 is a big hit. Lydia likes to retract the diving board (the diving board! I had forgotten about the diving board! ), move the deck chairs, open the top deck, stuff everyone including the dog down in the bilge, and close the top deck again. Narrrr, me hearties. That phrase, along with its arch, very slightly reproachful delivery, became a family byword. Get too enthusiastic about something stupid, and you were likely to hear from the Russian Tour Guide about it. This is not to say I grew up in an atmosphere of stymied enthusiasm. It’s true that the Baldwin family reveres the iron discipline of my grandmother, who one morning announced to a cigar-smoking salesman in the living room “Oh! I’m glad I’m rid of that filthy habit!” (she had quit just an hour before, and — this is the important bit — never smoked again.) But the Baldwin family also reveres enthusiasm (my uncle Bob can do one hell of a Prospector Pete I-struck-gold dance, when requested), so the Russian Tour Guide quote is meant mostly to poke fun at the speaker’s feeling of knee-jerk superiority, rather than the guide-ee’s effusiveness. 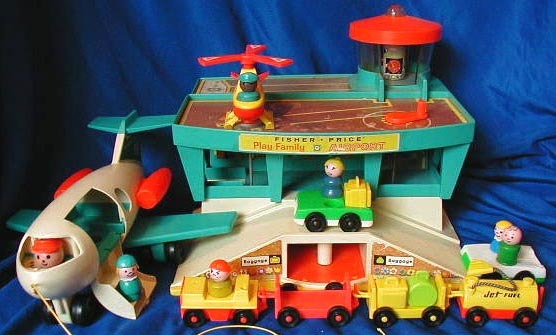 Which is all a torturous way of saying I no longer have one up on those with a Fiestaware jones, any more, as I’ve gone berserk for seventies Fisher-Price toys. I mean, seriously bug-nuts over the stuff. 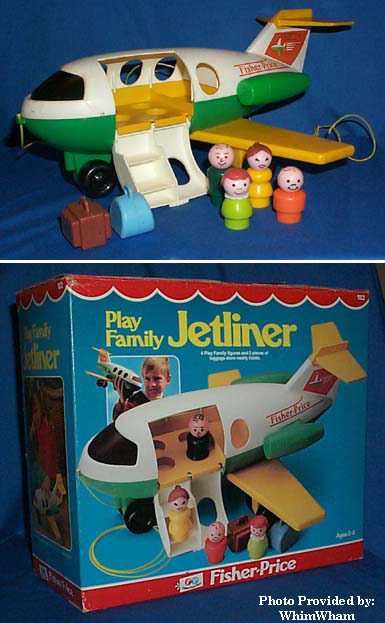 Why seventies Fisher-Price, particularly? I’m not sure, but I have a couple of bullet points around which to organize my effusiveness. 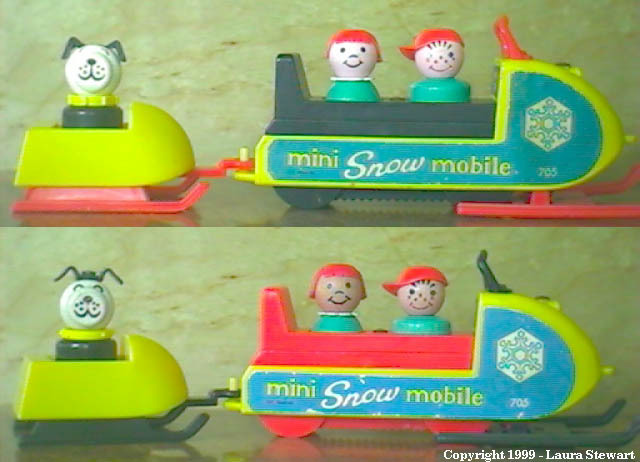 It doesn’t have the cutesy, foreshortened, hydrocephalic styling of the modern stuff. The little seventies figures, plain and unstyled as they are, seem to be representative of actual humans, not the bizarre little homunculi in the modern sets. Nostalgia. Okay, I said it, alright? It appears I have a weakness! My eBay trigger finger is itching! Must! Buy! Houseboat! With spring flag and dinghy! The snowmobile has a trailer for the dog. Oh lord that’s hip. See all the playsets here. PS. 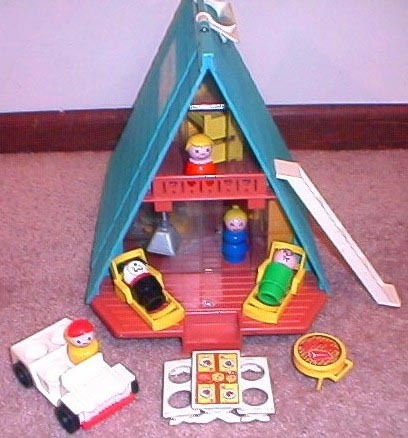 It turns out that I was only looking at the “Little People” playsets, and that there’s all sorts of other daredevil seventies stuff: “The Adventure People and their Wilderness Patrol“!? Come on, people, I’m not made out of stone!